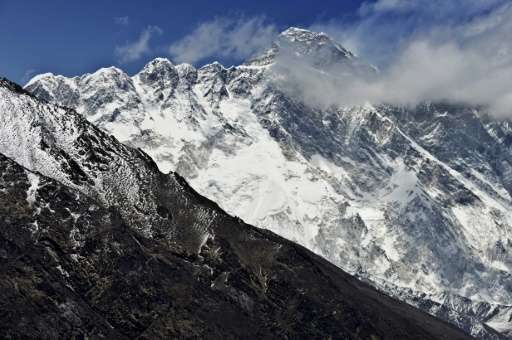 Rescuers have retrieved the bodies of two Indian climbers who died on Mount Everest last year but whose remains could not be moved due to bad weather, an official said Thursday. A team of Nepali climbers retrieved the bodies of Goutam Ghosh and Paresh Nath from the balcony, an area just below the summit of the 8,848-metre (29,029-foot) mountain. "Both the bodies are now in camp two in a place from where they can be airlifted. We are working out the logistics to bring them to Kathmandu," Sayeed Ahmeed Baba, an Indian official coordinating the operation, told AFP. Nath's body was found last year but bad weather forced rescuers to abandon attempts to retrieve it. Ghosh's remains were only located this year by other climbers on the mountain. "His body (Ghosh) was covered in snow and ice, so the team had to cut the ice to reach the body," Baba said. Both bodies were found above 8,000 metres—an altitude that marks the beginning of the "death zone" notorious for its difficult terrain and thin air as low oxygen levels heighten the risk of altitude sickness. The retrieval of corpses from such a high altitude is a controversial topic within the climbing community. Some rescue companies refuse to retrieve bodies at that altitude, saying it puts too many other lives in danger. "We do not risk the lives of the living to recover the dead," Dan Richards, CEO of Global Rescue, one of the largest rescue firms in the Himalayas, told AFP. "When it comes to recovering the dead there is an acceptable level of risk above which we do not go." A separate team will ascend Everest on Thursday to retrieve the body of another Indian climber who died over the weekend. Ravi Kumar, 27, died after summiting Everest and becoming separated from his guide. His body was spotted on Monday a few hundred metres from the main route climbers follow to the summit. "It is a very tough operation, risky as well. The body fell about 200 metres from the route into a very difficult area at about 8,400 metres. It is not easy to pull out the body," said Thupden Sherpa of Arun Treks, the company coordinating the mission. Six people have perished on Everest this season, including feted Swiss climber Ueli Steck who died during an acclimatisation climb in late April. The bodies of four more climbers were found on Tuesday, though their identities remain unknown and authorities suspect they could be fatalities from a previous year. At least 382 climbers have successfully reached the summit from the south side so far this season, with another 120 doing so from the Tibet side.